If you're reading this post, chances are you're curious about Nadya Suleman, the mom who delivered octuplets in January 2009 in Southern California. For those of you who want to get an update on her and her very large family of 14, tune in to The View this Wednesday, February 24th, at 11 am - Noon EST to find out. As a mommy of triplets plus one more all born within a year myself, I probably had a bit more compassion than the general public for Suleman when I first heard about her rare octuplet delivery. As a higher order multiples mom myself, my initial reaction was that she was one of us -- a higher order multiple mom -- and I wanted to reach out to her and her babies. But as the real details of her circumstances began to emerge in the weeks after her family more than doubled from an already large family of six very young children to 14 kids including EIGHT newborns, I was overwhelmed mentally even with just the thought of the kind of life that awaited this young mother at home after she was discharged from the hospital. 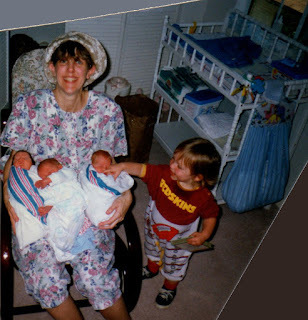 MommyBlogExpert with her 4 kids, all in diapers, triplets (2 months old) and "big" brother (age 1). To this day, I don't know how we managed changing so many babies with just the single diaper changing table and two Diaper Genies you see in the background. In preface to the thoughts expressed here, I want to point out that the purpose of this post is not to pass judgment on Suleman about the choices that she made nor on the ethics of the doctor responsible for her multiple bundles of joy. The world has already done a rather thorough job on all of that. The reality is that there are now eight more kids in the world and there's no turning back that will ever change that historical fact. It's now time to change perspectives because all of the things she should have or could have done before that world-famous mega multiple gestation are now moot anyway. Like most everyone else, I can't imagine what Suleman's true motivation or reasoning might have actually been when she conceived her record-breaking pregnancy as a single, unemployed mommy while her other half dozen young children waited at home. I mean how many women do you know who even if they were very happily married and had a sufficient enough income to afford yet another IVF attempt (averaging $10,000 and upwards per cycle) would go through with it despite already having six other children under 10 years old to love and care for? Even having just triplets with adequate help like I was blessed to have, I can assure you that it is unbelievably exhausting beyond your wildest imagination. Having a wonderful hubbie looking after our oldest son who was barely one year old while I was simultaneously locked up at the hospital for months to await the birth of my triplets, I know first-hand how emotionally difficult it can be when one is separated from just one child while hospitalized prior to a multiple arrival. But going through with a pregnancy like Suleman did with kids at home without a daddy? That just boggles even my mind. I didn't envy the world-wide media attention Suleman received when the octuplets were born any more than I wish I could trade places with her now. She has 8+ kids in diapers at the moment -- at one diaper per baby every 2 hours that is an astonishing 96 tushies to wipe and change every 24 hour period. No hubbie to help her either, with those diapers or all the assorted night time awakenings. That's not to mention feeding and playing with all those babies during the day plus taking care of and loving all her other children, too. How it the world does she do it? And, how on earth is she managing so far? Surely, all that frenetic household energy has got to be more tiring than any of us will ever be able to truly comprehend. Put into that perspective, I guess I do indeed feel fortunate that this exhausted mommy blogger had my hubbie plus extra help with the 48 diaper changes we all pitched in to do daily. Just between you and I, though, do you think we should let the octuplets' mom know what's coming next in the months and years ahead? Those eight little ones should be walking soon. Then, flash forward about 12 more years and Suleman will have eight kids hitting the teenage years in unison with a household already full of 6 others below the age of 21. My own four reached that teenage milestone recently like four fireworks going off in quick succession. In fact, I am wishfully looking back on those first few years of relative calm as I finish this post now. If you could give Nadya Suleman advice for the months and years ahead about what to expect what would you say? Please leave your comments at the bottom of this post and share them. Thanks for your candid thoughts. I'm looking forward to checking out the segment on DVR. I have one five-month-old and I feel like I have my hands full. I can't imagine three - or eight! I know how you feel. I still can remember feeling overwhelmed with just one baby too -- it is so much physical work when they are under one so hang in there. I honestly remember very little from my triplets' first year, but at least we took tons of pictures so it's not a complete loss. Remember to take lots of pictures of your baby every day because they really do grow up way too quickly. The segment was comical. I refuse to believe she isn't on some sort of medication. I'm not buying the "natural" energy. With interviews and photo shoots you have to wonder how much time she spends at home. I agree with Shelly that I felt Nadya was *overly* hyper. If I had triplets, like you do, Janis, I would be exhausted, and yet here with 14 she sounded like someone on speed. As a fellow Mom Ambassador for the View (you go, girl! ), I felt your post here was informative and measured (probably more than my own comments! ), and I enjoyed seeing your take, as a mother of multiples, on the issue. Thanks for the kind words and your honest feelings about this. BTW, I wrote this post prior to the show airing and after watching it I'm not surprised about her behavior (and the way she was dressed) on the show yesterday. There is definitely something wrong with a person that needs to brag repeatedly on national TV and say things like she did on The View, like "I'm smart and I have straight A's" (not to mention her references to her former self as possibly delusional). I'd be worried about the welfare of any children (even an only child) living with either a mom or dad that acted like that. My biggest question of all is as a mother: how could she leave her 1 year-old octuplets (and the other 6 kids) home and travel from the West Coast to NY just to be on a TV show that she wasn't even paid to appear on? I know even if I was PAID to be on television, I would insist as a caring mother that the segment be filmed as a remote from my home so I wouldn't have travel so far or be away from my kids like that. The thought of so many little lives dependent on HER for security, significance, and strength is frightening! Thanks for sharing this.. I had not seen it! I did not see any point of her being on the show.... waist of perfectly good air time. She has no idea what she's got herself into. If I could give her some advice it would be to try to keep sane, hire more nannies and take an hour each day for herself, SLEEP MORE and get a routine! Great post, props on the triplets! I would tell her to get off the drugs,spend time with your children . I feel so sorry for these kids ,you never see her with the kids unless its to make money off the pictures. It would have been perfect for her to take 1 or 2 the older kids with her to NY and get some Mom time and spend the day away from younger babies. She is only thinking of herself and to show off her weight loss . She just doesn't get it! You are so right on all counts. I feel so sorry for those children of hers because I'm sure ALL of them would want nothing more than a mom who was physically and emotionally present for them.